Each day we hear or read about death in the news. For clinicians, we experience the secondary and tertiary effects of death and dying almost daily. Such was the case for much of Europe from the 1300s-1700s mostly due to plague. The peak of the plague was from 1346-1353. Spain, Italy, France, Austria, Byzantium, Germany, Sweden, Denmark, Ukraine, and Russia were all affected. Between 75 and 200 million people died due during that time due to the plague. Death was everywhere. During the middle ages, much emphasis was placed on the prevalence of death. 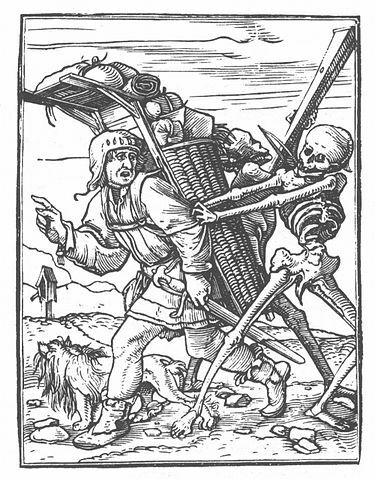 Around 1547, a book called The Dance of Death featured wood carvings that depicted death as following all walks of life. Death affected everyone—rich and poor, haughty and humble. Over forty wood carvings were crafted. The only thing that I see that the wood carvings are missing is God or an angelic being depicted along with death. Seeing these wood carvings made me think about our perspective in dealing with death. We can either choose to see only death surrounding us or we can hold the belief that God is with us as well. The latter may provide a distinct advantage during the stages of death and dying. Next Was Paul an Apostle?